THE MARTINI CHRONICLES: Quick Meals For a Busy Diva...Pineapple Teriyaki Salmon! Quick Meals For a Busy Diva...Pineapple Teriyaki Salmon! Well, over the past month or so, I've noticed that I have been eating way too many meals outside of my home. I'm talking breakfast, lunch, and dinner! And I really can't use the excuse that I've been too busy at work to prepare meals. After all, I'm always busy at work...but I also have several recipes in my arsenal that I can prepare fairly quickly. So this week, I've decided to "check myself," and make a greater effort to cook more. And since I am always in a sharing mood, I decided to share the following recipe for Pineapple Teriyaki Salmon that I came across last year. Of course, this recipe is courtesy of my favorite food magazine/website, Cooking Light. This is a dish that I have prepared many times at home, mainly because it tastes delicious and I can prepare it quickly. It's also pretty healthy, which is always a plus. 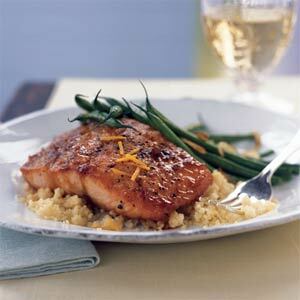 So, check out this recipe for Pineapple Teriyaki Salmon, a be sure to let me know how you like it. Enjoy! - Combine first 4 ingredients and 1/4 teaspoon salt in a small saucepan over high heat, and bring to a boil. Reduce heat, and simmer until reduced to 1/4 cup (about 15 minutes). Set aside. - Heat oil in a large nonstick skillet over medium-high heat. Sprinkle both sides of salmon with remaining 1/4 teaspoon salt and black pepper. - Add fish to pan; cook 3 minutes. - Turn fish over and place in oven; bake at 400° for 3 minutes. - Remove from oven; brush 1 tablespoon sauce over each fillet. Return to oven, and cook 1 minute or until fish flakes easily when tested with a fork or until desired degree of doneness. - Sprinkle with orange rind, if desired. How many of you are frequent home cooks? About how long do you typically spend preparing your meals? Hi there! You some form of professional? Nice message. Can you tell me tips on how to subscribe your blog?